The entire cotton abrasive discs are made with whole cotton sheets joined by a seam around the central hole, or entirely sewn. This article can be made from different types of cottons, with impregnation or natural, depending on the consistency of the material to be processed. The disc in whole cotton is particularly suitable in the roughing-out and polishing processes, both in the manual working and in the automatic one, depending on the size of the disc. Usually the large discs are mounted on automatic robots, while smaller ones are installed on manual machines. 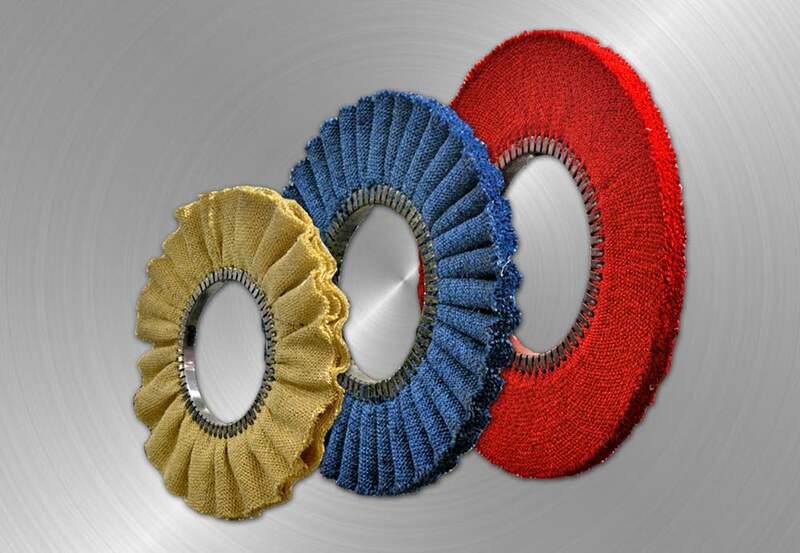 Depending on the softness of the cotton, these cotton abrasive discs are used for the polishing or finishing processes. The materials on which such article is used with more frequency are brass, the zinc alloy, aluminum and stainless steel. Sisal abrasive discs are made with sisal, a textile fiber of rough plant origin. Thanks to this characteristic, this fiber is used in the roughing-out process of metals. 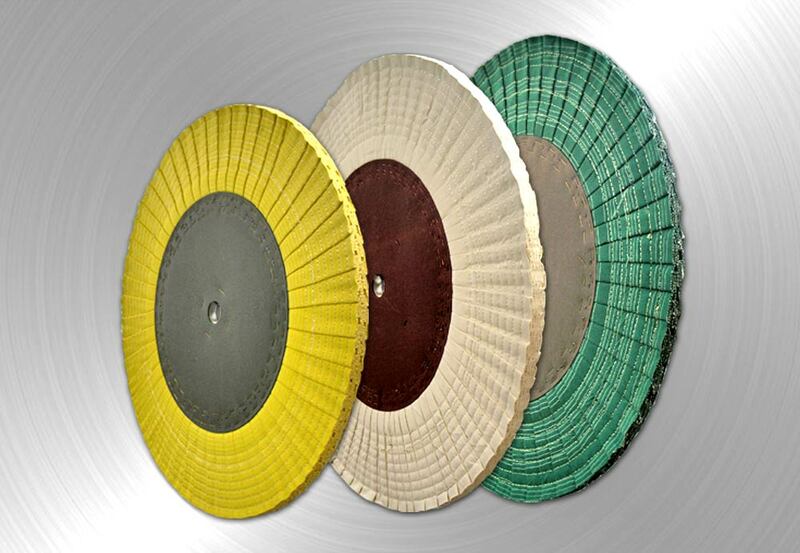 Sisal abrasive discs present a hard abrasion suitable to impress in a decisive manner on the workpiece. In fact, this type of disc is mounted, during the operations of polishing of metals, on the machines suitable for the roughing-out of the workpiece, that means in the first steps of the finishing process of the raw materials. Sisal abrasive discs are also available in sisal-cotton, in order to increase its abrasive force on the workpiece to be processed. 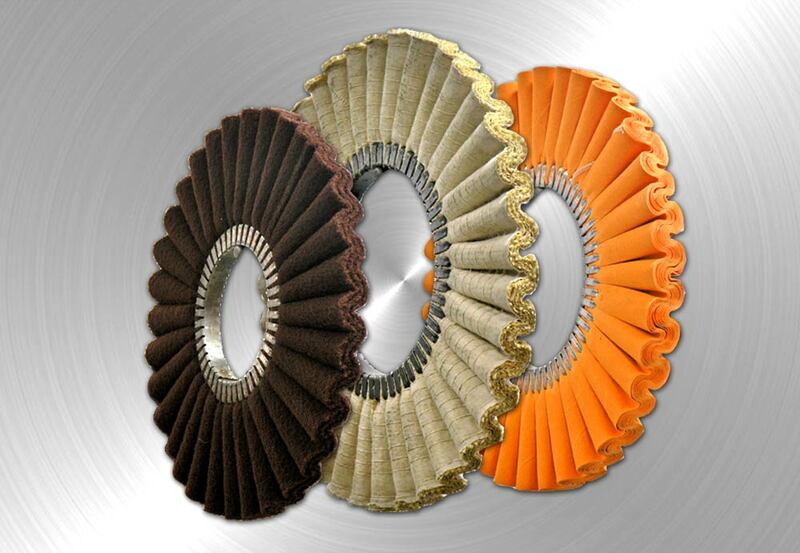 This particular type of disc can be composed of both several types of cutting and polishing cotton, and sisal/ cotton, for roughing out process. There is also the possibility to resinate sisal/cotton discs with various colors , to make even more rigid and incisive the corrugated disc. The cloth is folded in such a way to get regular corrugation. The main use of the corrugated discs, consists in mounting on a shaft more elements so as to obtain a cylinder with a compact surface, since the convexities and concavities of the discs fit together perfectly. The working surfaces on which the corrugated discs is particularly suitable are the aluminum and brass; it is also used with excellent results in the polishing of the pots. 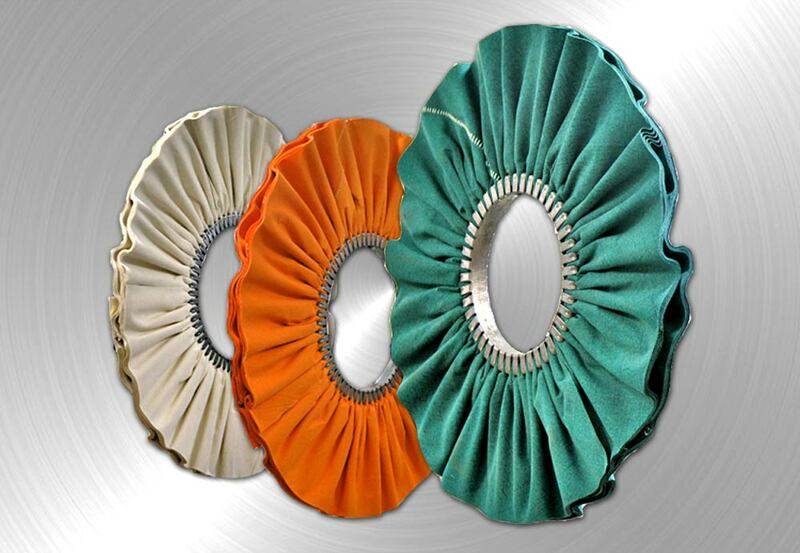 Fold up discs can be composed of both cotton, for the finishing processes and sisal/ cotton, for roughing out processes. The fold up disc is used in immersion processes of shaped articles and mounted on rotary tables machines which work either continuously or by jerky shots. The particularity of this disc is precisely the pleating, that means how the cotton sheets are overlapping so as to form elastic folds, which allow a perfect balancing of the wheel. The main strength of the fold up wheel is the ability of penetration into the workpiece, since the elasticity of the folds, created by the cotton, allows to wrap partially the workpiece to be polished and accordingly, to allow a perfect finishing of the object. 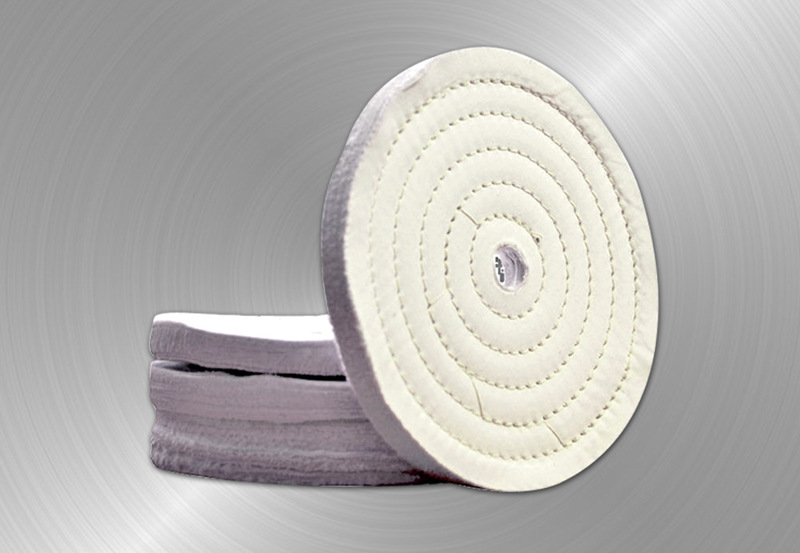 Ventilated abrasive disc can be composed of both sisal, sisal/cotton, for roughing out processes and several types of cotton for the finishing processes of the surfaces. The ventilated disc is used both in manual workings that in those robotized. Its main feature is precisely ventilation, that means how sisal or cotton are disposed so as to avoid overheating of the disc; this occurs through the air passage in the external part of the disc. Consequently, the ventilation allows the perfecting of the finishing process of the metal, without causing any damage to the product under treatment. The ventilated disc is available in several types of cotton and colors, which are distinguished according to the hardness. The processing of information is carried out in compliance with the D.L.G. 196/2003 on the protection of personal data. The use is only for internal purposes and it is guaranteed in the strictest confidentiality.